I'm a sucker for a happily ever after. 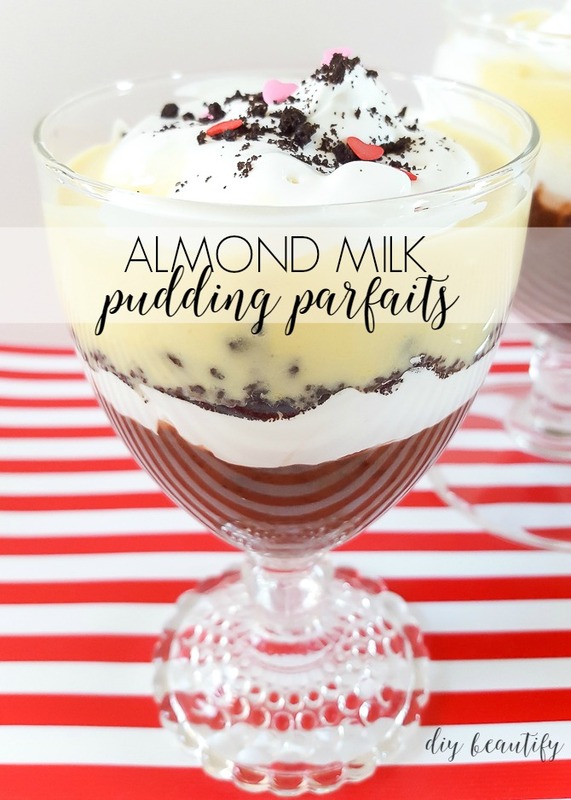 And these almond milk pudding parfaits make me pretty happy! You'll find the recipe a little further down. Back to love stories...don't you find that a story filled with just highs and sunny skies doesn't reel you in as much as one where the couple has obstacles to face and hurdles they must overcome?! When the story goes so far as to present a tragedy they must endure, it makes their love story one to remember! One of my favorite authors, Nicholas Sparks, has a new movie that will be released on February 5, The Choice. You can watch the trailer of The Choice here. In our 23+ years of marriage, Mr DIY and I have faced multiple cross country moves, sick parents, miscarriage, death and the debilitating disease of depression. We've chosen to stay together, even though there have been times it would have been easier just to call it quits. Giving up is not an option, and each day we make choices that cement our marriage and make our love stronger. And sometimes they're small choices like..
want to see the action flick! I'll be the first to admit that we are FAR from perfect and we both blow it frequently, but at the same time, knowing that we are both committed to this thing called 'marriage' and making it work...makes our marriage stronger. I believe we'll have our own happily ever after! One of the recent choices I made was to veer away from my typical gooey, decadent (read heavy on the calories) chocolate-y Valentines dessert because Mr DIY is on a low-carb diet. I still wanted to make something that we could enjoy together and feel like we were spoiling ourselves, without ruining his diet and success thus far (way to go babe, I'm so proud of you!). So I made Chocolate Vanilla Pudding Parfaits, an easy treat that is impressive to look at and makes you feel like you're eating something really special...especially when you serve them in pretty footed goblets. To make it a bit healthier, I used sugar-free pudding and almond milk. There's a trick to using almond milk and it's the addition of cornstarch. I read about it over at Single Girl Gourmet. You can read her post and then come back here because I have a few tips to share about my experience. Here is everything I used to make these non-dairy pudding parfaits. I learned a few things while using the cornstarch and almond milk. First, make sure you sift your dry pudding mix with the cornstarch before adding the almond milk. It will make for a creamier texture. My other tip is to watch the quantity of almond milk you add. If the recipe on the box calls for 3 cups of milk, use a little under 2-1/2. If the recipe calls for 2 cups, use a little under 1-1/2. You get the idea. Assembling these pudding parfaits is easy and quick. And I can't wait to share them with my honey when he gets home from work tonight. I hope you check out The Choice, in theaters February 5...the perfect Valentines movie!